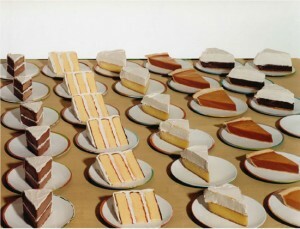 In her recent series, Thiebauds, Sharon Core stages and photographs tableaus of cakes, pies, soup, and sandwiches that duplicate Wayne Thiebaud’s still-life paintings from the early 1960s. 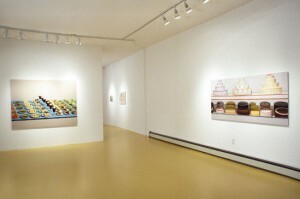 Thiebaud is also a borrower, referencing styles and motifs from previous modern movements as well as artists whom he admired, but without resorting to mere imitation. While her painstakingly created scenes are impressive, Core walks a fine line between homage and copy. Core cooked and prepared the food in her photographs; the work she put into the process is impressive (one might even consider this as performance). 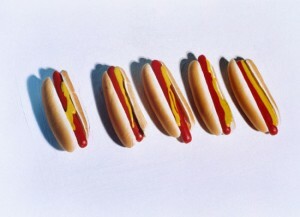 The twelve photographs on view (no baker’s dozen?) 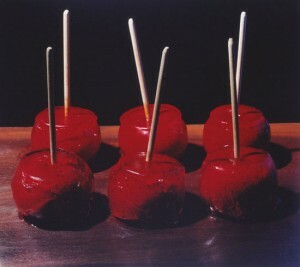 are glossy and seductive, much like the delectable treats she creates. 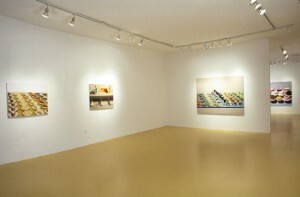 The size of each aluminum-mounted C-print matches the dimensions of Thiebaud’s original paintings. 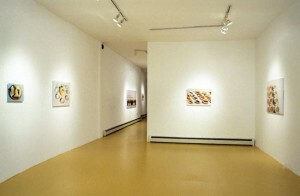 The titles of Core’s works are also identical to his. 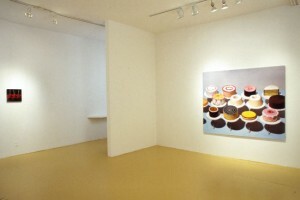 But whereas Thiebaud painted his scenes from memory, Core works from catalogue reproductions. Much of Thiebaud’s oeuvre is concerned with the formal qualities of painting: line, color, composition, pictorial space, and painterly effects. 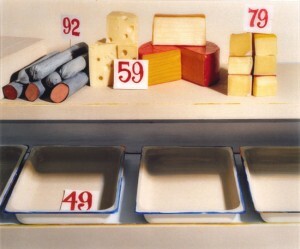 Core reproduces faithfully Thiebaud’s thick, pasty signature brushstrokes, not only in her schmears of cake frosting but also in the robin’s-egg-blue countertops in Club Sandwich, the shelves and trays in Delicatessen Counter, and the white surface in Five Hot Dogs. In Cream Soups, she fills her bowls with what looks like paint rather than actual soup. 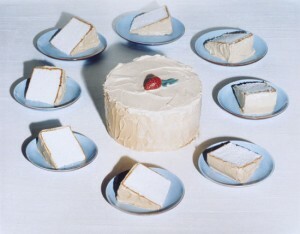 In these photographs, Core tries to represent photographically the “illusion” of Thiebaud’s canvases. She successfully uses decisive camera angles to replicate the painter’s often-awry picture plane, most evident in her treatment of space in Club Sandwich. She also sensitively lights her scenes, casting shadows to match the painted ones. But the shallow depth of field in several images reveals the uncompromising, mechanical eye of the camera, rendering the rear row in Cakes, for example, out of focus. Verisimilitude also breaks down slightly in other places, where round pieces of cardboard push out from underneath the cakes. 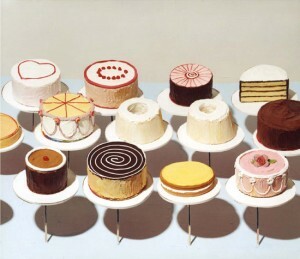 And a few of the tiered cakes in Cake Counter, haphazardly fashioned when compared to Thiebaud’s ideal forms, would not have escaped a confectioner’s kitchen. Most appropriation art deals with institutional critique, either of the art world or the larger social and political sphere. Although Thiebaud’s work debuted in New York at the same time as Pop, his candid, naïve celebrations of Americana lack the ironic smirk, knowing wink, or blank face of, say, Andy Warhol or Roy Lichtenstein. It seems unlikely that Core is taking the artist to task for his apparent disinterested, autonomous position. 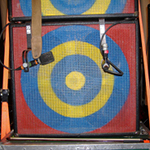 Appropriation has become a common working practice for contemporary artists. Sherrie Levine re-photographed works by Walker Evans and Edward Weston to undermine the myth of authorial originality and to dispel the notion of “truth” in the photographic image, long considered an inherent aspect of the medium. Vik Muniz too challenged documentary photography while raising social concerns in his photographs of sugar drawings, and he sets off a range of playful associations with his portrait of Freud in chocolate syrup. Most similar to Core’s Thiebauds are Muniz’s re-creations of installation views of Minimal and Postminimal works from the Whitney Museum’s collection, drawn in dust gathered from the museum’s offices. In this series he hints that, with the distance of time and the acceptance of these works into the art-historical canon, these sculptures may themselves be gathering dust. In contrast, Core’s photographs—though conceptually clever and beautifully executed—seem to uphold and affirm the tradition of fine art instead of questioning art-historical myths and commodity culture. The danger here is that appropriation art emptied of critical objectives can leave us with only a spectacle of mimesis. Originally published in the Brooklyn Rail in March 2004.